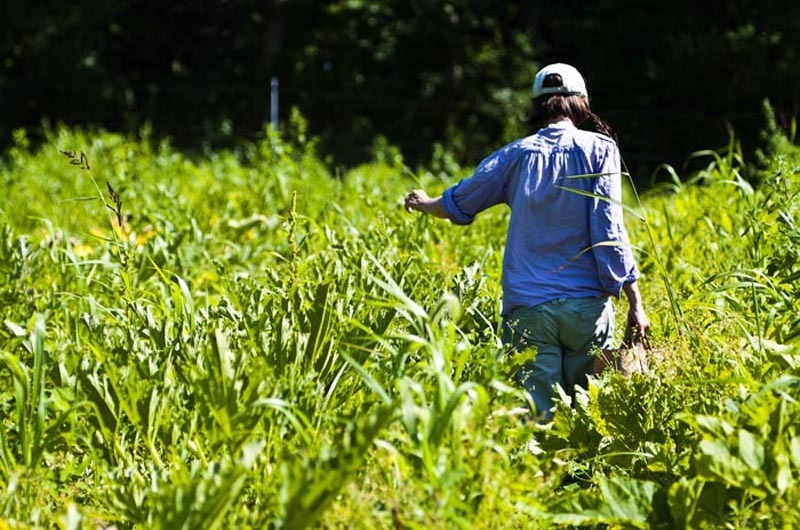 Jamie O'Gorman of Island Grown Gleaning at work in the field. In 2014 we rescued more produce than ever before — almost 25,000 pounds! And mild weather kept us gleaning later than ever into December. Mid month we thought we were going out for our last harvest at Morning Glory Farm when we collected 1,335 pounds (winter squash, carrots, and even some beautiful greenhouse lettuce). But surprisingly, we found ourselves back there for another glean on Dec. 30, making it the latest on record. It was bitterly cold and windy, but due to school vacation, we had an enthusiastic group of children who participated fully by picking kale and sorting stored pumpkins and squash. As featured on NPR, one memorable November day found us hosting 30 inexperienced eighth graders from the Tisbury School. We also welcomed youth gleaners from the Belchertown Girl Scouts, New York city’s Riverside Church, and in collaboration with Island Grown Schools, each of the local public schools. Great work everyone. And great food. Green beans, bok choy, sweet peppers, onions, parsley, zucchini, potatoes (and so much more) made it onto Vineyard plates thanks to Island Grown Gleaning and all of the generous farmers that we work with. Contributing farms included: Morning Glory, Whippoorwill, North Tabor, and Beetlebung. Cronig’s Market also donated some of their imperfect produce, including bananas and berries, which we sorted and delivered. So where does all of this food go? And are there really hunger issues on the Vineyard? Yes — Vineyard Committee on Hunger finds that one in 10 year-round families will seek food assistance annually. The Island Food Pantry had 2,405 visits last year. The pressure on low-income Islanders is real. Per capita income in Dukes County is the lowest in the state, the cost of Island living is estimated to be up to 20 per cent higher than other areas, and seasonal employment is a way of life. Island Grown Gleaning works with Serving Hands, Island Food Pantry, Family-to-Family, and low-income housing developments like Morgan Woods, Tribal Housing, and Island Elderly Housing to serve this segment of the population. But it’s not only poor families who lack access to fresh produce. Consider the elderly and disabled: many of them cannot drive or have mobility issues, limiting trips to the supermarket, and thus limiting the availability of fresh vegetables. To answer this problem, we bring the produce right to their doorsteps, delivering to all five Councils on Aging (senior centers) and Woodside and Hillside apartments. We also partner with Martha’s Vineyard Community Services and addictions recovery programs to make sure that the people who can really use a little extra help are getting produce donations. This year some thoughtful farmers went the extra mile just to meet community needs. We helped distribute 500 pounds of potatoes that Whippoorwill planted especially for Family to Family Thanksgiving meals. And we helped with 1,200 pounds of beautiful sweet potatoes that Wise Owl Farm and North Tabor grew as a donation. Our volunteers offered approximately 1,000 hours of harvest time over the course of 60 gleans. My sincere appreciation for all of the many people who make this program the wonderful success that it is. It’s true, as the proverb goes, that many hands make light work. Island Grown Gleaning has the proof. Jamie O’Gorman is program leader for Island Grown Gleaning. This year-end newsletter was circulated recently by email.